With an 8:20 flight and a 1hr 10min ride to the airport, being out the door by 5:30am was our goal. We made it by 5:38, but ended up hitting quite a bit more traffic then expected, on route to Denver. We were still fine time wise and although I was pretty tired, I didn't fall asleep in the car. Or so I thought. I remember becomming really sleepy as we approached the airport. I saw the sign for Pena Blvd. which is the exit that takes you directly into the airport. It's also about 10miles long. All of a sudden, I wake up, from "not sleeping," to Chris saying he thinks he missedhe exit. I said "you're not on Pena? I saw that exit awhile ago!". I literally must have fallen asleep right after passing the sign. Chris does about 90% of the driving, and I never worry about him falling asleep or anything like that. Where as with me it's a different story. He was so glazed over, that he completely missed the sign + exit and went a good 15 miles past. Luckily this is a quick trip, and we didn't have any bags to check, but we were still nervous. We turned around, with the clock at 7am. We had a good 10min + the drive on Pena, parking the car, waiting for a shuttle, and making our way through the very large airport. We made it to the security line by 7:25am, but the line was pretty long, and we still had to catch the tram to the gate. We got to gate A 48 at 7:55 only to find out the gate changed. The one time I don't double check on the TV's it of course changes. We start sprinting to the opposite end of the gate. Chris got a good head start and I was in flip flops, with my computer bag and rolling carryon. Quite the sight I'm sure. I resorted to a fast walk so I wouldn't lose my sandals and finally made it to the gate. They just started boarding. Never a dull moment! Im sure you all have a similar story or two? Moral of the story? Should have made that coffee to go! 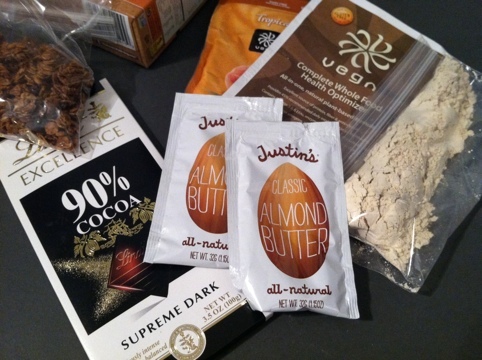 I was planning on a delicious Jamba Juice smoothie, but resorted to eating some of my packed snacks instead. 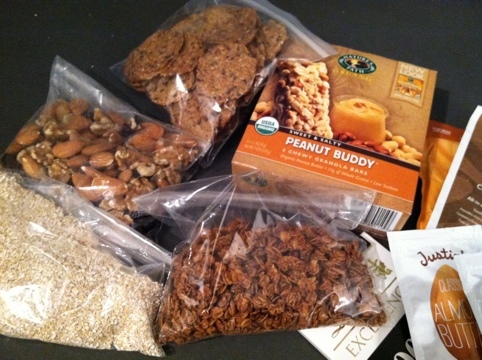 Nut butters, protein powder, dark chocolate, oat bran, pnut butter granola bars, cranberries/walnuts/almonds, Mary's crackers, and Love Grown Foods cocoa goodness granola. 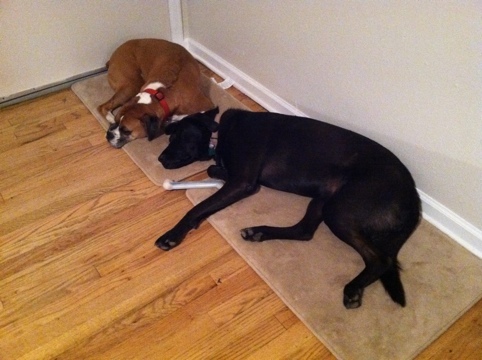 The dogs are at home, being taken care of by K+E. 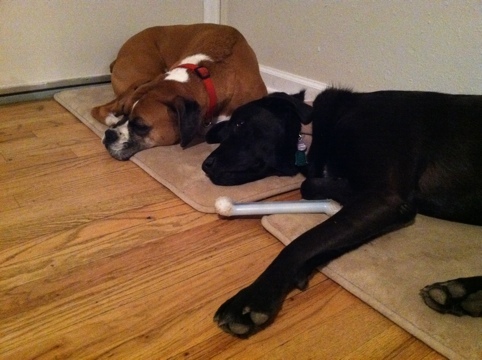 Quick trip but I miss them! 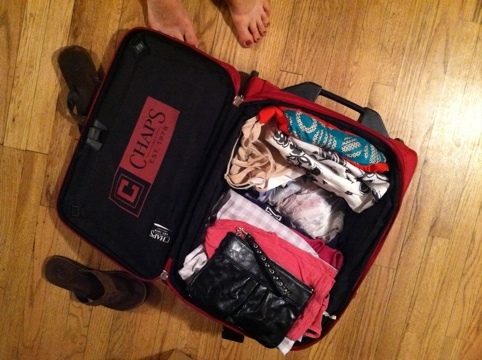 Packing dress clothes in a carry on is always fun! 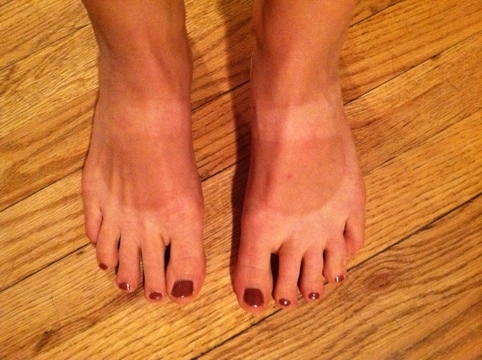 Oh and check out my sweet tan lines from my vibrams! Time to get ready for the rehearsal!